While on a trip to Virginia…. ~ ~ ~ ~ we made a side trip to the famous Lucketts Vintage Store. ~ ~ ~ ~ so off to the garage for a new “outfit”. I bought a quart of Valspar paint in the color “Well Water”…. ~ ~ ~ ~ not quite sure whey they called it “Well Water”. So here it is…can you see it???? That pretty pop of Aqua Blue in the corner? 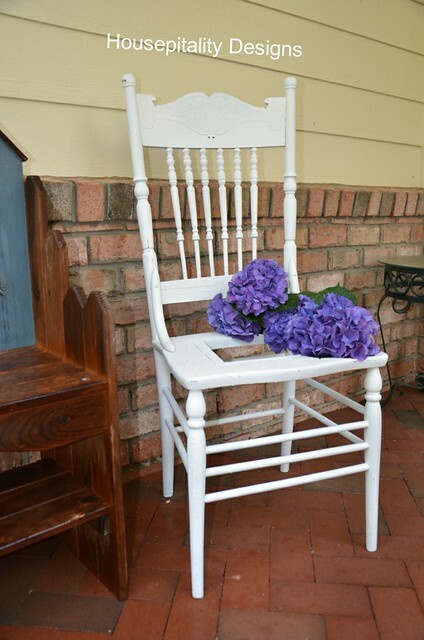 For you see, I am bringing in more pops of pretty blues in the upper porch. As it fills me with great “joy” to see this pretty color as I sit and enjoy the view! AND NOW I BRING YOU AN ANNOUNCEMENT…. 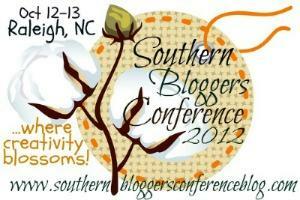 There will be a SOUTHERN BLOGGERS CONFERENCE BLOG HOP LINKY PARTY!!! ……….Beginning this coming Friday morning, August 10th. conference, write a post and tell us why you are attending….what you hope to learn and achieve by attending..
and/or any thoughts you may have that may benefit this conference…. 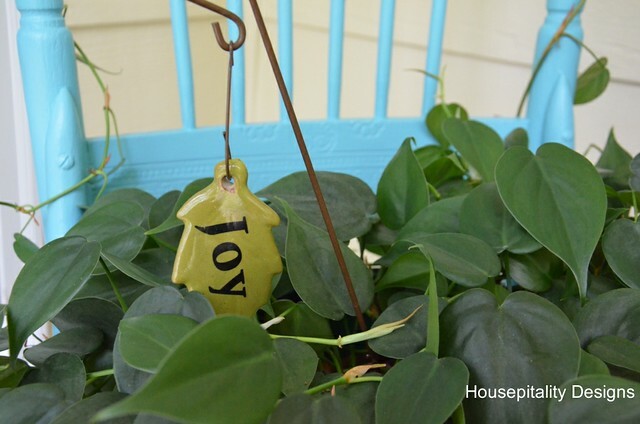 AND….there may just be a fabulous giveaway for those who link up!!!!…. So stay tuned to our blog post on Friday, August 10th for this fun Linky Party…..
Wouldn’t it be fun to know who will be attending….or thinking about attending!! This party will be ongoing until October 12th, 2012!! I love what you’ve done with this chair, Shirley! You’ve given it a whole new persona!!!!!! loving that blue color! how fun- the conference link party, I may just have to stop by. I will be attending. Laura…so I have the utmost pleasure of being able to see you again?! !…I am truly looking forward to seeing you again..!!! Love the chair. 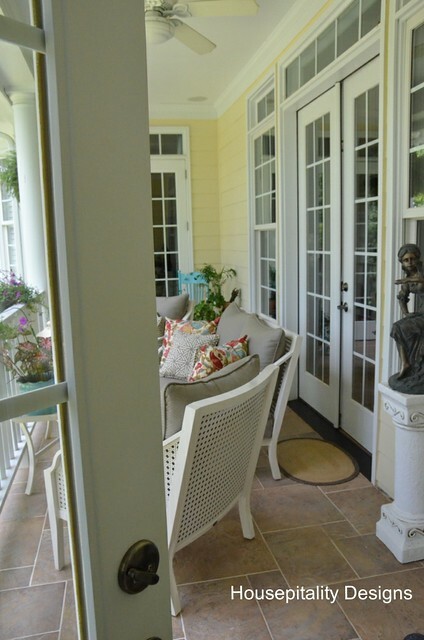 Yes, not sure how they came up with well water for that color, but it sure is pretty on your porch. Shirley, I just love that pop of blue! I’ve been adding small touches of it to my home. There is something so refreshing about that color. Love it! What a happy color, Shirley! Good idea on the Linky party! Let’s get some excitement happening!! I’m not sure why one has to go through a second step when leaving a comment at your blog. First you fill out your name, email address and blog and then you get another form asking for your WordPress user name and password. Have you tried commenting on your blog? Will definitely check it out Barbara….sorry you had trouble!! 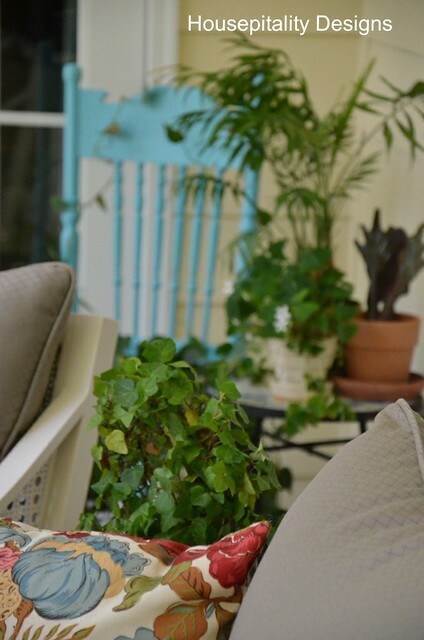 Your blue chair is just the perfect pop of color on the porch! Bright turquoise. Why not make a statement,. Love it.! 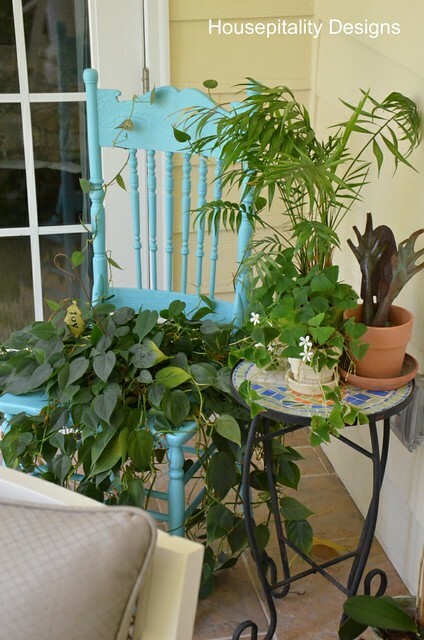 I love the chair and the plant. It is so bright and cheery. 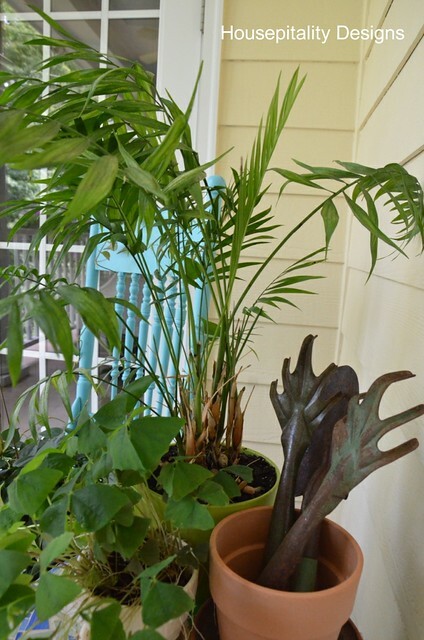 She is pretty Shirley and she looks beautiful in her new home amongst all that pretty greenery! Shirley, this is great! I love the way you picked up the aqua in your pillows! It all looks so pretty! 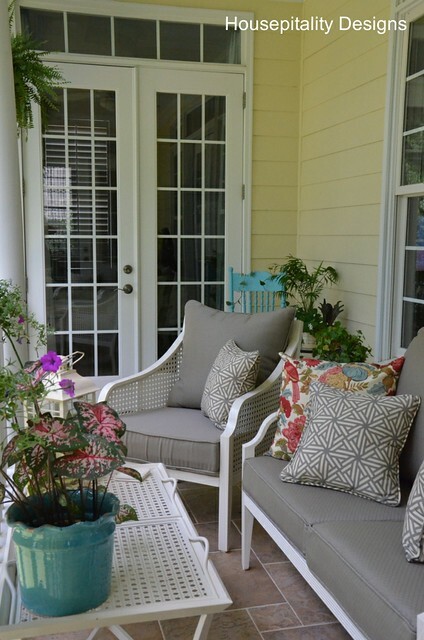 I don’t think I would ever leave this porch; I love it! Shirley, I love the chair and the color. I can never figure where they get these names for colors.I can’t think of one just now but some don’t evoke a thought of any color. What ever they call it, it works. 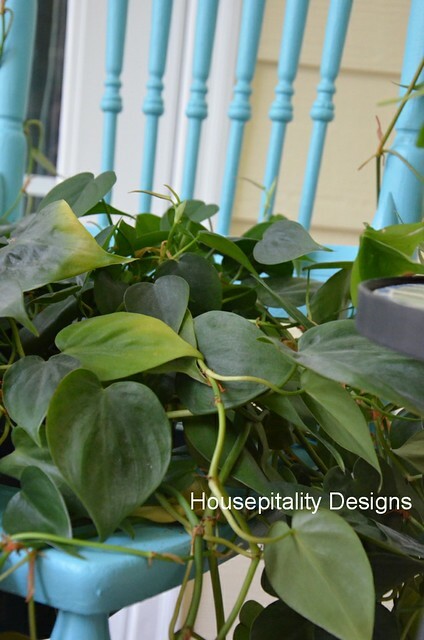 Looks fab in that corner with the beautiful pothos. I will be attending the conference and I will be linking up. Love the Well Water on your porch Shirley! I always thought it would be a fun job to name paints or OPI nail polish shades! You KNOW I am all about a pretty blue chair, Shirley. 🙂 Love this! It looks fantastic, Shirley. Love the color, too. But, Well Water? I’m with you about how they arrive at some of the names. For a second I thought I was at my grandmother’s. I know she had a chair just like this. Hi, Shirley: Not only is that my favorite color, I love the way you intermingled the plants around it. Just gorgeous! I love it. 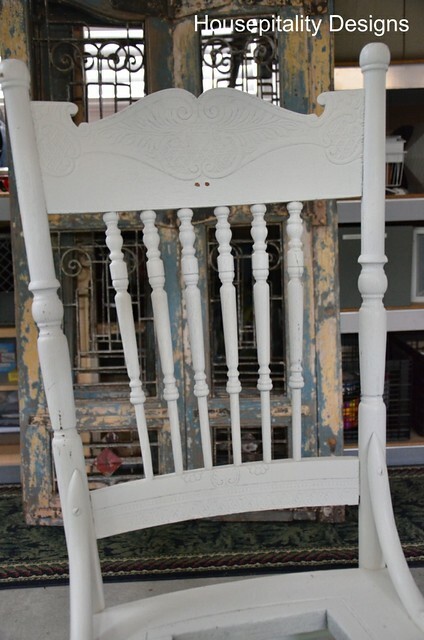 Oh Shirley, this chair is TOO pretty!!! I really love it on your porch with all your other furniture. That really is a great color! What a nice place to sit and enjoy the view. I love that pretty color of blue you’re adding to your porch. That was a good choice for that chair. Hope you’re having a nice weekend so far. 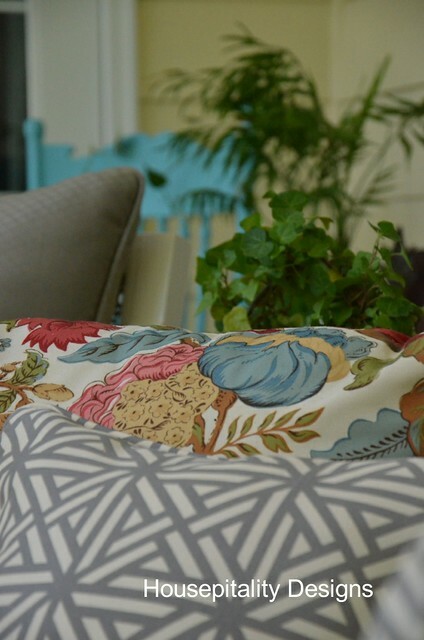 It’s the perfect compliment to that fabulous patio set! Oh that is an absolutely gorgeous color! I need to find an excuse to get it:P And I love love how you made it the home of that beautiful plant! Wonderful idea!! Love the decor of the color and what you used the chair for. Added a nice touch to your other patio features.